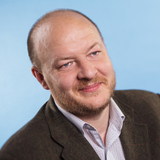 Simon Wardley is a Researcher for the Leading Edge Forum, a global research and thought leadership community dedicated to helping large organizations become more successful by identifying and adopting Next Practices at the growing intersection between business and information technology. Simon’s focus is on the intersection of IT strategy and new technologies. His most recent published research (January 2016) is entitled "Clash of the Titans: Can China Dethrone Silicon Valley?" where he examines the impact of strategic competition at a national and global level, gauging the progress China has made and the likely developments going forward. His previous research covers topics including "Of Wonders and Disruption", "The Future is More Predictable Than You Think: A Workbook for Value Chain Mapping". Simon has also covered topics including "Beware of Geeks Bearing Gifts: Strategies for an Increasingly Open Economy", "Learning from Web 2.0" and "A Lifecycle Approach to Cloud Computing". Simon has spent the last 15 years defining future IT strategies for companies in the FMCG, Retail and IT industries. From Canon’s early leadership in the cloud computing space in 2005, to Ubuntu’s recent dominance as the No. 1 Cloud operating system.